Here is the latest information on the books of one of my clients, who has recently reached out to 15,000 law enforcement officials to let them know how his books can help them deal with illegal immigration and the opioid crisis. Here the release. Feel free to share this with others. The controversy over how to deal with illegal immigration and with the opioid crisis has been growing, reflected in a series of news stories raids by ICE, missing kids, separating families and children, the recent stories of suicides by celebrities, school shootings fueled in part by drugs, and more. These incidents have added to the debate about what to do. To provide some insights in how to deal with these crises, publisher Paul Brakke of American Leadership Books, specializing in books on criminal justice and American society, has reached out to numerous community groups, social media fans, government officials, and over 15,000 police chiefs and sheriffs around the U.S. He has offered these suggestions, based on his most recent book: Dealing with Illegal Immigration and the Opioid Crisis -- suggestions also discussed in a series of informational videos and in a social media campaign. In his book Dealing with Crime by Illegal Immigrants and the Opioid Crisis, Bakke looks at these two current crises which are closely linked, because of the relatively high percentage of drug traffickers who are illegal immigrants. He also discusses how the controversy over the death penalty for drug dealers plays into this crisis. Finally, after laying out the Department of Justice stats which put some perspective on these issues, he concludes with some suggestions for fixing the illegal immigration mess and some suggestions for dealing with the opioid crisis. 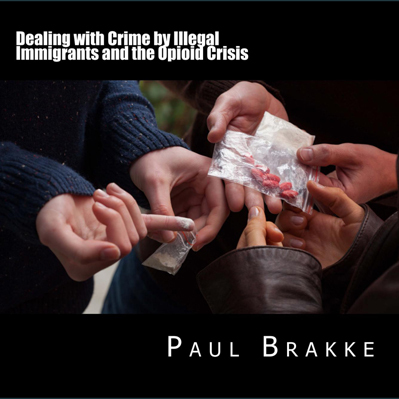 Based on these books, Brakke has been developing various programs to help professionals in law enforcement, government agencies, and political leaders apply these suggestions in his books, videos, and talks to reduce illegal immigration and opioid use and abuse. Brakke has similarly been contacting police chiefs and sheriffs about his other books which deal with other law-enforcement community problems, such as The Costly U.S. Prison System which provides a careful, close-up conservative look at what's wrong with the prison system and how to fix it. The key topics covered include: a recent history of incarceration in the U.S., facts about our prisons and correctional system, how other countries deal with prisons and recidivism, ways to reduce recidivism, and ways to reduce incarceration and cut costs. For more information and setting up speaking engagements and interviews, please contact Paul Brakke at brakkep@gmail.com or at 501-503-8614. Get E-mail Alerts When Gini Graham Scott, Ph.D., J.D. -- Author of Fifty Books Sends news releases.